Remove them from the pcb, put the plate on the pcb and secure some switches ON THE PLATE (switch into plate and later into pcb). Basically your switches will keep the plate with the pcb togheter, since the switch is soldered in the pcb and clipped on the plate. got it! thank you very much..
Just wanted to say thanks to Mehkee for making this group-buy possible. It's a helluva deck for the price. Beautiful kit, and a lot of fun to tinker with. Everything was put together really well, for the most part. Finished work on customizing the 96KEE kit to make it more my own. I couldn't leave well enough alone.... I needed to get the deck prepped for GMK Laser caps! I had asked DJ after the GB if he'd be okay with changing my gunmetal grey kit to a silver one as I planned on customizing it a bit, and he graciously helped me out. It's appreciated! Took care of making the switchplate and the feet a nice hot pink, as well as powdercoating the aluminum frame a lovely textured purple that just about matches the purple that MiTo decided to use for GMK Laser. Being a graphic designer myself, I had to do some 'digital digging' into the design a bit to figure out the rough PMS color which is actually present in the renders since he used a Pantone plugin in his render engine (according to his posts). The color's pretty close, so I'm happy. I ran into a bit of a snag, though. The acrylic inserts for the frame had the ends broken off. Probably just an oversight. No big deal. I considered asking DJ if he could send me replacements, but it would have taken too long to get it all situated as well as being one more thing to bug him about, so I just went ahead and reverse-engineered it a bit and cut duplicates of them. I also improved them a bit as the originals didn't go all the way to the ends of the channels on the aluminum frame, so I made them fit a bit better. Unfortunately the only frosted acrylic I had on hand was 6mm thick so I had to use plain ole clear for 2mm acrylic. Oh well. I decided on 67g Zealios to drop on to the deck along with white 1.8mm LEDs. Everything soldered up, tested, and working perfectly! Thanks, Puddsy! Bah... that's nothing though, haha. My personal casemod project logs tend to be dozens of pages in length with over 200+ photos sometimes. Just depends on what it is! I'm an old-school modder so I tend to keep my 'project log kung fu' prominent and in good shape. I believe in documenting everything. In the social media age, the kids are losing that ability, and it's a shame. But enough soap-boxing. Hoping for some more 96KEE kits up and running and some pretty photos to follow! I might make some drawings of the acrylic pieces in SVG or some other format so people could get custom acrylic cuts. The frosted is cool but I'd love to get some sort of black/tinted acrylic in there. I would like to know what type of screws I should purchase for this board. The screws that came with it I find to be both too short and non-magnetic, so I'd like to purchase better ones. Thanks. Need an honest opinion from anyone who's still reading this thread. Missed this GB and looking to pick up one of the extras if they go on sale. This would be my first build. Would love to know your experiences so far building this guy and if you would have possibly opted for this optioning presented with both. This is my second 96 build and I think all builds\projects have their own issues. If you're interested in building your own board, I think either of these kits should do you well. P.S. I'm probably going to get that ymdk board too because it looks neat. Thanks! Makes sense. Just wanted to kind of hear that it wasn't some crazy finicky experience. In for one of these. Thanks for offering the extras. Edit: SNAP... did I get my order in before they ran out? That was fast. Does anyone of you know how to reset the firmware to default? I've tried to update the firmware to the latest version 1.4.0 here: https://github.com/showjean/ps2avrU/releases, but after I've uploaded it, the underglow LEDs are not accessible and I'm missing some keys like pad " - ", left "alt" and "win" and even backspace. Does anyone have a pic of what the keyboard matrix looks like? Also does anyone know if I can run qmk on this? I'd like to do this as well. How do you go about figuring out what the matrix looks like? Wasn't for me, I did have some concern about flashing the firmware after some people had problems. But in the end it was a pretty smooth build. I'd definitely recommend it. If you don't mind please screenshot your firmware version? You can see it in "Options" then hit "Connect" button, on the upper right hand you see the version, please post it in here so that I can download the default version, then last request, please save your layout as .hex and you can share it here, for us to download it. Thanks much! Is there an easy way to tell if my order made it in the first round of extras or not? I guess it doesn't really matter but I'm curious. Sorry for the noob question. For those of you who experienced the same fate as mine after upgrading to 1.4.0. I've managed to access the LED underglow and i think restore the default firmware by rolling back to version 1.3.2, you have to be in bootloader mode to do this, to load in bootloader mode, press "LCrtl" before inserting the usb cable, while holding the "LCrtl" insert the USB cable, then the in-switch LED will start to blink fast, that's the sign that you're on bootloader mode, while on bootloader mode, on Bootmapper, go to "Options" tab, then hit "Firm up" button, locate the "ps2avrGB_NKRO.hex" from the folder "ps2avrGB_firmware_V1.3.2_170531" that you've extracted from "ps2avrGB_firmware_V1.3.2_170531.zip" to load it, voila! The original keymapping is restored, my missing keys appear again and i can access the LED underglow. Anyone have any pics of the blue or red case? I can't seem to find any online. Has anyone tried a 1.25-1.25-1.25-6.25-1.25-1.25-1.25-1.25 layout for the bottom row? Very curious if this is possible. 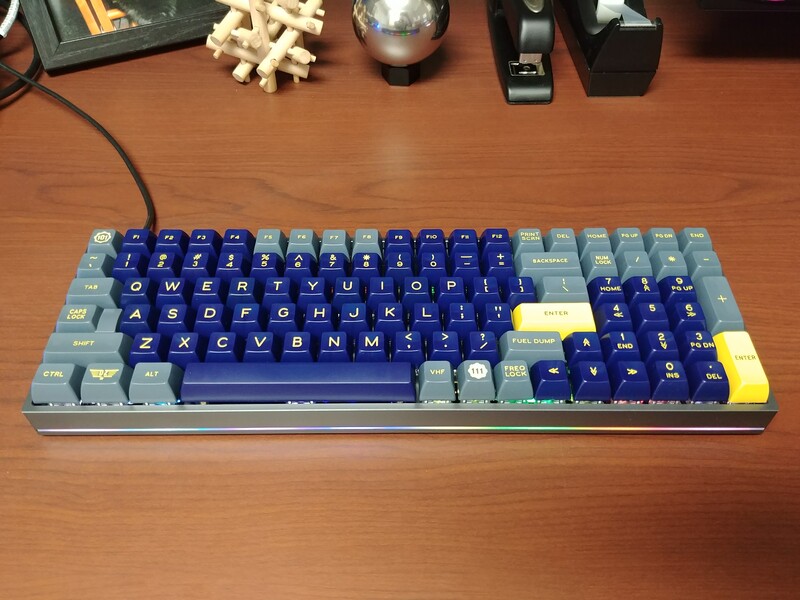 Has anyone gotten QMK going on one of these yet? All BootMapper boards are 32a. 32a controllers aren't programmable? Or just aren't compatible with QMK? That's not necessairly true anymore. Someone adapted V-USB into QMK and there are a few boards that are supported, to some degree. I think the RGB doesn't work 100%. Since you guys seem to know a bit about qmk and controllers maybe you can answer this question for me. Where can I get help flashing a board with a atmega32a controller? avrfreaks.net? I wasn't sure where to post my question and people in the threads I read didn't seen particularly inclined to help newbies. Lots of posts with complaints about people not reading the wikis. I have an ALU84 that has a 32a controller which is unresponsive. I have a programmer (USBASP) but I didn't see a DFU bootloader on microchip.com for the atmega32a controller so not sure what to do. Any pointers would be appreciated. Have you tried Flip? What are you trying to flash to it? I haven't tried FLIP. My end game is to get QMK on my ALU84 and on my 96KEE. No idea if this would maybe be a viable way to get a board again. Can anybody tell me the basic steps to putting this board together? E.g. do switches go over plate before soldering, stabs are put on at what step? I'm waiting for my kit to get powdercoated and will be putting it together soon, but this only the second board I have put together. For anyone like me who wanted to know the screw size: M2, 5mm depth, not that all of my screw holes were fully drilled, but the ones that are, this works great. Also you can get screws that are magnetic, makes building it easier. I could try typing out what to do, but its probably easier and more entertaining to watch a youtube video outlining the process. This video has the basics but isn't a build guide for this board, but the process is basically the same. Thanks, for the info. I would definitely like to upgrade to magnetic screws. Where did you source yours? So is this board plate or pcb mounted switches? All Cherry MX PCBs support plate-mount switches unless there's something unique about the board that prevents the use of a plate. Nothing like that exists as far as I'm aware. There are some boards that come with "half plates" that would make using all plate-mount switches difficult, but again, that's an issue with the plate and not the PCB. This PCB has the holes for PCB-mount switches. So the answer is: both. Good to know, thanks! So what do you/others recommend when building this board? Going with pcb-mount? I'd use PCB mount if you can get them. Will help keep switches in the right place while you're soldering. Especially on the bottom row where the plate has support for so many different layouts. Laptop repair kit on Amazon. It's not -too- hard to find them. Once I get my store going, I plan to specialize in small fasteners. Unlike the nightmare I'm having with my EXENT, this board went together easily and fired up with a standard layout right out of the box. Great job, Mehkee! I'm missing a plate screw. Are those the M2 x 5mm mentioned a few posts up? Edit: Bootmapper with the latest ps2avrGB 1.40 firmware works great. I'm all set. Is that Danger Zone you have on your board? Looking good! I love the look of SA sets, but hate typing on them. Has anyone made any headway into getting QMK running on a 96kee? Yup, it's Danger Zone on 65g Zilents and Zeal's clear, screw-in stabilizers. They're my new favorite switch, hands down. Amazing. Got mine all setup! Everything seems to be working great after the firmware update. I got mine powdercoated at a local shop; using GMK retro w/ 9009 addons and box whites. That looks dope af. Really like that white case. How durable is powder coating? Does it chip/flake? Man I discovered the community so late... I wish I was part of the GB/project !!! Powdercoating is as tough as it gets; you would have to take sandpaper to the case and work hard to get it to scratch. For those of you wanting something similar: there are in stock blue and red kits for sale right now. I bought a blue kit, knowing that I would have it powdercoated. For those wanting the case in a cool(er) color, I suggest you do what I did. Even with the cost of powdercoating (around 100 bucks) you will spend around what most 96 key kits cost, but you will have a much nicer looking case that will look nice for decades, plus you don't have to wait around for all the other GB to get around to shipping 6 months to a year after you buy. I'm honestly considering buying another one of these and having it coated just for the hell of it. Well, I would...but I already ordered the CA66 and am waiting on a custom wood 96 key! Plenty of other budget 96 key GBs on Taobao. Find a proxy and you should be able to get yours for cheap.